GDC 2019 takes place at the Moscone Convention Center in San Francisco, California. 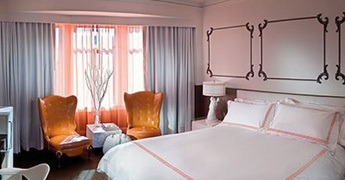 Book early for discounted hotel rates and find information about traveling to San Francisco and getting around the city. GDC 2019 housing is open! GDC and Convention Housing Partners have secured discounted rates on hotels near the event for attendees. Book now for the best availability and lowest rates. Where is the Moscone Convention Center? For information about San Francisco transit, weather, traffic conditions, and parking, visit 511: The Bay Area Travel Guide or call TravInfo at 415-817-1717. 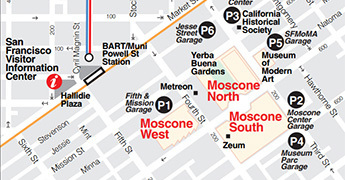 The Moscone Convention Center is conveniently located by major freeways 280 and 101. Street parking is limited but there are several parking garages located around the center. Muni is one of the most economical ways to get to the event. Bus lines run often and stops are located extensively throughout the city. BART is an economical and convenient way to travel to the event if you are staying near the BART line. Disembark at the Powell Street Station, exit to 4th and Market Streets, turn right on 4th, walk two blocks south to Howard and turn left, and you'll find Moscone South on your right and Moscone North on your left. Take Caltrain from the south bay to the Caltrain Station (Fourth & Townsend): Across Fourth street from the train station, you can board either the #15, #30, or #45 Muni lines and disembark at Third and Folsom. Walk one block North up towards Howard St. Turn left on Howard and you'll find Moscone South on your left and Moscone North on your right. San Francsico International Airport is the Bay Area's largest airport and California's second busiest. Flying into SFO is the best option for international visitors. BART is connected to the airport providing easy access to the event and many surrounding hotels. Ride shares like Lyft and Uber, taxi, and rental car service is also available. Out-of-state event attendees may find better flight fares flying into the smaller Oakland Airport. BART also connects to OAK providing easy transport to the event and hotels. Ride shares like Lyft and Uber, taxi, and rental car services are also available. Learn about transportation to and from OAK. For general parking information in and around the Moscone Convention Center, consult the parking map. Save 42% or more on admission to San Francisco’s top attractions with CityPASS tickets, including prepaid tickets for 3-day Muni Cable Car and Bus Passport, California Academy of Sciences, Blue & Gold Fleet Bay Cruise, Aquarium of the Bay, and San Francisco Museum of Modern Art (SFMOMA) or the Exploratorium. Enter the code "GDC19" in the promos tab on the Lyft app for $10 off your first ride. Valid for new users only and does not cover tips, cancellation fees, or damage fees associated with the ride. Check out deals in the city for fun, food, and sightseeing from San Francisco Travel. Use discount code HBCLK for 10% off of one-way or round-trip transfers, and/or for shared rides to and from SFO. This site may include links to third-party websites which are not part of this site. When you access those links, you may leave this site. Those links are provided for your convenience only. Neither UBM LLC nor any of its affiliates (i) endorses or accepts any responsibility for the content of websites (nor the products or services on them) accessed through those links, (ii) is responsible for the availability of those websites and (iii) will be liable in any way for any loss or damage you may suffer by using those websites. If you decide to access those websites, you do so at your own risk.